Get ready for another installment of Guess the Food! I give you the ingredients and you leave a comment with your best guess for what this is! I think this one might be an easy one, but there are some weird ingredients that surprised me to see in this list. So let’s dive in and see if anyone can get this! The winners get nothing except virtual Internet hugs. The serving size on this stuff is pretty small but it’s worth noting that this food is more caloric than whole milk. It’s not a diet food, but you also wouldn’t eat a whole lot of it (or maybe you would?!). The rest of the nutrition info is pretty straightforward. It’s mostly salt, people. Salt and sugar. Salt and sugar. That’s what makes this food tick. Okay. There’s some weird stuff in here that I couldn’t figure out. See if any of it helps you! 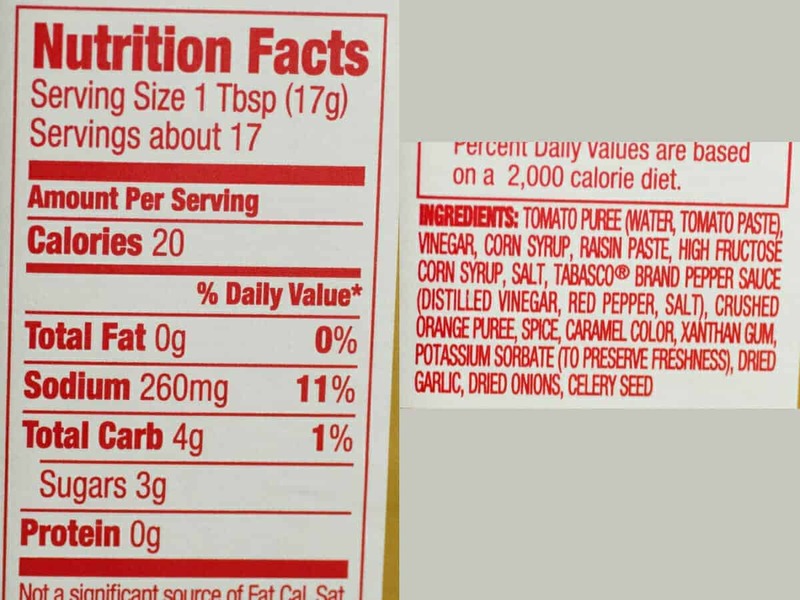 Remember that ingredients are listed in order by volume. Tomato Puree – The bulk of this food is a tomato puree. Pretty basic. Vinegar – Plain old vinegar. I’m assuming it’s just white distilled vinegar. Corn Syrup – Was actually surprised that this wasn’t HFCS, but maybe they didn’t need it that sweet. Raisin Paste – I’m assuming this is just a puree of raisins. Haven’t seen this in many foods over the years. High Fructose Corn Syrup – Oh hey old friend! Guess you are in this after all. Salt – There is more salt than spices, which come later. Tabasco(R) – COOL! The real stuff. I never knew this about this food. Crushed Orange Puree – Okay. Now we are just getting weird. I’m assuming this is orange peels that are pureed. Spice – Cool. Most generic ingredient ever. Caramel Color – Gives this food it’s distinct color I think. Xantham Gum – A thickener and emulsifier to keep it one consistency. Potassium Sorbate – Standard preservative. Dried Garlic – Just a weeee bit of garlic in here. Dried Onions – Even less dried onions. Celery Seed – Weirdly the only spice listed individually. Almost zero of it since it’s the very last thing. That’s all there is to this food. I was kind of surprised to see some of the stuff in there though and was mostly thinking the list would be salt, HFCS, and spices. The other stuff is interesting and almost makes me want to try a homemade version of it! So… can you GUESS THE FOOD? Leave a comment! Serving size is a tablespoon so I’m guessing it’s not a beverage and the whole package only has 17 tablespoons in it. Thinking some sort of sauce or condiment. Not ketchup…..
sound like some kind of spicy BBQ sauce to me. I would go with A-1 bold and spicy. Advertises the Tabasco right on the label. Nailed it! Nice job sir! Definitely A.1. Bold & Spicy Sauce! A-1 Steak Sauce!!! Love this stuff!!!! Totally. You got it Dana! Even with celery seed being the way last ingredient, I think you can really taste it in this stuff. I believe is some barbeque sauce?